One of the biggest, ongoing news stories of the year has been the collapse of Syria as a state and the subsequent refugee crisis in Europe. Past NECSI research has chronicled the chain of events leading from short-sighted US market policies to rapidly rising food prices to widespread social unrest, including the Arab Spring, which destabilized Syria in particular. In September, a paper detailing this analysis was published in the Proceedings of the National Academy of Sciences. This paper, "Accurate market price formation model with both supply-demand and trend-following for global food prices providing policy recommendations," explains the antecedents of the Syrian crisis, but NECSI research also offers insights into the solutions. Syria is a fractured country with multiple internal factions in conflict. According to our past research on ethnic violence, the spatial distribution of ethnic groups predicts the locations of violence. During a special presentation at Tufts Fletcher School, Prof. Yaneer Bar-Yam called upon the next generation of researchers to use our scientific results in seeking a solution for Syria, possibly through a federal system which sufficiently separates ethnic groups by providing them with appropriate autonomy. One of NECSI's student researchers is seeking to lay the groundwork for these efforts by performing a spatial analysis of Syria's ethnic populations. In 2014, NECSI researchers including co-faculty member Nassim Taleb, postdoc Joe Norman and president Yaneer Bar-Yam co-authored a paper on risk. This paper, "The precautionary principle (with application to the genetic modification of organisms)," argued that certain kinds of risks are so catastrophic that, even if they have a very small chance of occurring, they should be avoided at all costs. Widespread use of genetically modified organisms was cited as an example of such a potentially catastrophic risk. This month, the Philippines Supreme Court instituted a temporary ban on field testing of genetically modified eggplant in that country. The Precautionary Principle paper has been cited in conjunction with this decision. This concept may have been influential in multiple other governmental regulatory decisions. Also this year, in a letter published in Issues in Science and Technology, we applied the Precautionary Principle to models of climate change. The conclusion is that even if we had no supporting evidence, the uncertainties in the models about the risks being taken are enough to warrant precautionary measures be implemented. Back in 2014, NECSI researchers advocated a community based strategy for the response to the out of control Ebola epidemic in West Africa. As our research shows, traditional strategies for stopping outbreaks may be insufficient for dealing with new, virulent strains of pathogens. Our analysis demonstrated that an alternative strategy of community-level monitoring in which all members of the population areas affected are tested for symptoms is both effective and robust in real world conditions. Of their own accord, local groups eventually adopted such tactics to great effect, performing daily door to door screening, resulting in the rapid decline of the epidemic and its reduction to the current "getting to zero" stage. Just yesterday the World Health Organization (WHO) declared the end of the original transmission chain in Guinea. The importance of community response was recognized in April of this year by the WHO in its lessons learned from the epidemic. In May, while the epidemic lingered on in some areas, our efforts were acknowledged by an article published in Time. You can read that article here. Can We Predict Market Crashes? The 2008 financial crisis led to a new imperative to understand market dynamics and crashes in particular. It has long been thought that market crashes are triggered by panics that may or may not be justified by external news. This year a NECSI paper on predicting economic panics, titled "Anticipating economic market crises using measures of collective panic," was published in PLOS ONE. The paper showed that the recent economic crisis and earlier large single-day panics were preceded by extended periods of high levels of market mimicry — direct evidence of uncertainty and nervousness, and of the comparatively weak influence of external news. High levels of mimicry can be a quite general indicator of the potential for self-organized crises. In June, a ground-breaking NECSI paper was published in Physical Review Letters. The result of multiple years of research, this paper provides mathematical support for a bold new theory on the evolution of aging. We demonstrate that rather than aging being the unfortunate but inevitable result of biological deterioration, human physiology is capable of ongoing repair. However, this repair is being stopped by an evolutionarily determined genetic mechanism that results in aging and death. This paper is an extension of our research on the limitations of applying averaging methods to evolutionary theory, and the difference between kin and group selection, a hotly debated topic in the field of evolutionary biology. In brief, we showed that by freeing up local resources for its descendants, a mortal organism has a long-term advantage over an immortal one. Hence mortal organisms are favored and their lifespans are controlled by ecological conditions, i.e. the amount of resources that are available. This result would not hold for theories that use averaging to eliminate the difference between what happens in the local area of one organism or another. Thus traditional theories do not have this effect. The implication of our work is that the current lifespan of human beings was determined by ecological conditions during evolutionary history and interventions in those mechanisms could extend youthful life dramatically. This paper, titled "Programed death is favored by natural selection in spatial systems," received considerable coverage in the press, including Science News, BBC Radio, Motherboard, and io9. A NECSI paper, published this year in Complexity, calls into question the effectiveness of medical experiments, including drug testing, and points to the need for better methods that combine empirical and theoretical analysis to overcome simplifying approximations. "The limits of phenomenology: From behaviorism to drug testing and engineering design," mathematically explains the inability of mainstream empirical research to correctly predict what happens in many real world conditions. The paper shows that there are too many ways that varying circumstances and individually unique properties can affect the outcomes. These effects are ignored in standard approaches. This is the reason that drug testing, using double blind randomized trials, can miss potentially lethal interactions and side effects. What is needed is careful analysis of approximations and their replacement by methodical testing of well-framed theories of system properties. Counter to current dogma that discounts the role of theory in studying medical treatments, a combination of theory tested by experiment is much more powerful than a purely empirical approach. Still, the paper also cautions that decision makers need to recognize the inherent uncertainties in scientific knowledge. 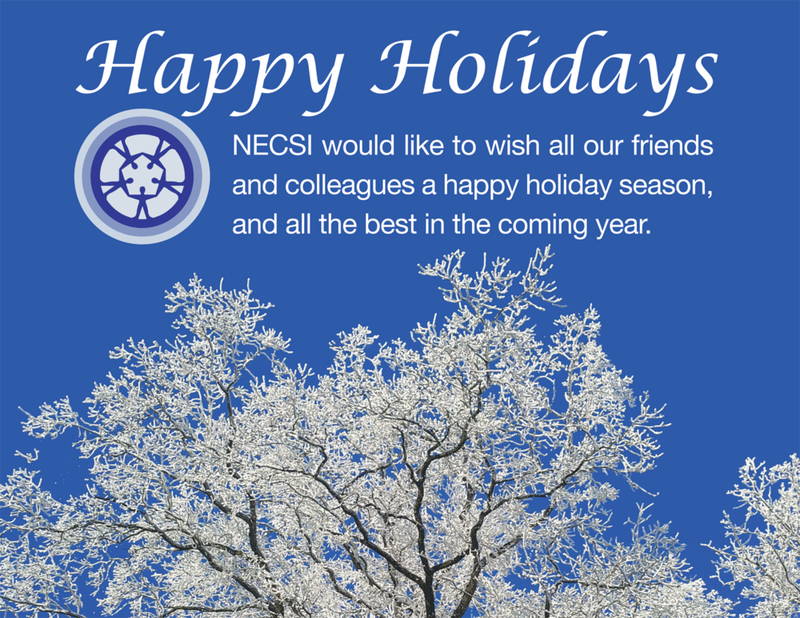 Throughout the year, a number of other NECSI works were published. A new NECSI book, titled Conflict and Complexity: Countering terrorism, insurgency, ethnic and regional violence, was published by Springer. In addition, NECSI affiliate Hiroki Sayama published a new textbook on complex systems titled Introduction to the Modeling and Analysis of Complex Systems. Sayama was also appointed as the director of the new Center for Collective Dynamics of Complex Systems at SUNY Binghamton this year. Prof. Bar-Yam provided the keynote speech at the center's launch in October. This month, NECSI co-faculty John Sterman, of MIT and Climate Interactive, attended the United Nations Framework Convention on Climate Change. Sterman calculated that the pledges made in Paris would only reduce the impact of global warming by 1°C.